4/29/2011 – MAITLAND, FL – Chef Joe Alfano, of Universal Orlando CityWalk, is the winner of the very first Florida Tomato Foodie Award, a tomato feature contest that celebrates chefs who are really into Florida tomatoes. 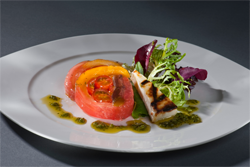 The winning feature is Alfano’s “Florida Tomato Terrine with Spring Mix and Grilled Ricotta Salata,” made with a trio of Florida tomatoes – pear, yellow and field-grown red. It is presented with fresh spring mix greens, grilled ricotta salata, and basil vinaigrette. The winning entry was selected by Florida Chef Justin Timineri, executive chef and culinary ambassador of the Florida Department of Agriculture and Consumer Services and the Florida Tomato Committee, who sponsors the contest. Foodservice features are being accepted through June 20, 2011 for the spring contest, with new submissions being accepted in September in line with the next Florida tomato season. In addition to an official “Florida Tomato Foodie Award” winner certificate from the Florida Tomato Committee, winners are awarded a cash prize and a Florida tomato.